This luxury modern grey and white double ended curved free-standing bath is part of our our bath collection containing some of the most desirable bath designs available today. 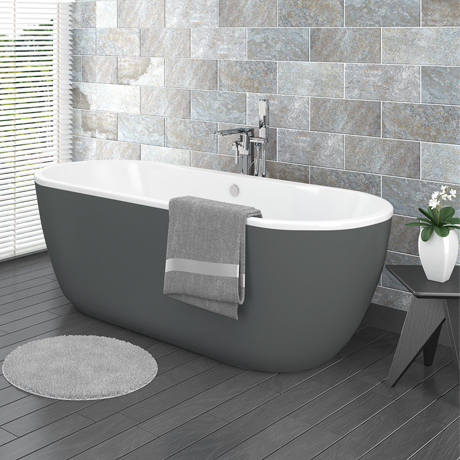 Contemporary in design, but family friendly in price, this modern bath is great for adding 'wow factor' to new bathrooms. If you want to make a statement with your bath design, then choose from our luxury collection. Made with quality grey and white gloss smooth acrylic. Looks like a good product. Sides look Matt in the photo but are quite glossy in reality. Tricky to pick up as it's so curved . Pick up by the plastic covering is best method. Not installed yet but looks good quality.